Donald Trump Tweets About 'Rocket Man,' Vowing More Pressure On Kim Jong Un : The Two-Way As President Trump tweeted, Ambassador Nikki Haley talked tougher Sunday. "We're trying every other possibility that we have," she said, "but there's a whole lot of military options on the table." A South Korean soldier watches a TV local news program Saturday depicting North Korean leader Kim Jong Un. For just under half an hour Saturday night, President Trump and his South Korean counterpart, Moon Jae-in, tackled the missile threat looming from Pyongyang. The pair of leaders condemned North Korea's recent ballistic missile test — and once more vowed to strengthen their joint defenses and ratchet up economic pressure on Kim Jong Un still further. Trump asked Moon "how Rocket Man is doing" — as the U.S. president put it in a Sunday morning tweet — and took note of the "long gas lines forming in North Korea," presumably as a result of the stricter sanctions recently implemented. Just days ago, the North sailed a ballistic missile over the northern Japanese island of Hokkaido for the second time in three weeks. The new launch — Pyongyang's fifteenth missile test this year and its first since testing its most powerful nuclear weapon yet — immediately drew a raft of international condemnations. After their conversation Saturday night, Trump and Moon declared their commitment "to continuing to take steps to strengthen deterrence and defense capabilities and to maximize economic and diplomatic pressure on North Korea," according to the White House. "The two leaders noted that they will continue their close consultations next week when they meet on the margins of the United Nations General Assembly." That round of meetings next week will mark Trump's first address to the large international body. 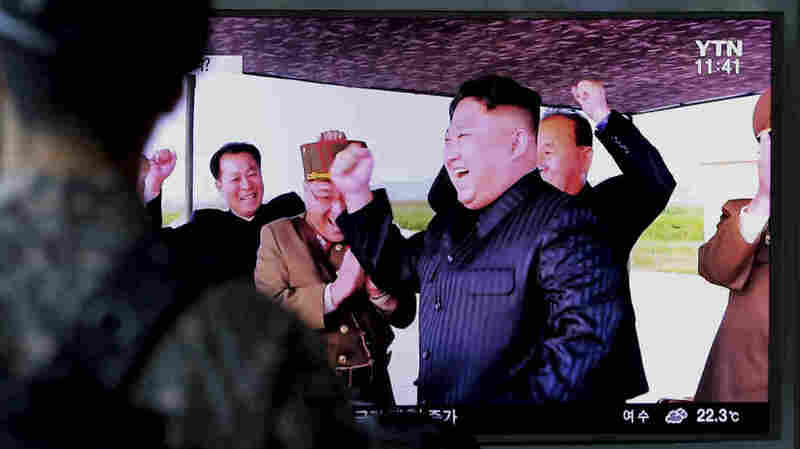 And it's expected that the agenda will feature a heavy dose of talks about North Korea, which the U.N. Security Council unanimously slapped with a new set of sanctions earlier this month over its nuclear program. Those sanctions went after North Korea's oil and textile industries, seeking to deal a severe economic blow by significantly cutting the number of imports other countries would receive from the North. Still, they were less harsh than those initially proposed by the U.S. — and Nikki Haley, the U.S. ambassador to the U.N., spoke ominously of the possible failures of diplomacy. "We have pretty much exhausted all the things that we can do at the Security Council at this point," Haley told CNN on Sunday morning. "Now ... I'm perfectly happy kicking this over to [Secretary of Defense] Gen. Mattis, because he has plenty of military options." "If North Korea keeps on with this reckless behavior, if the United States has to defend itself or defend its allies in any way, North Korea will be destroyed — and we all know that," Haley added. "And none of us want that. None of us want war."